What a surprise! The main stream media appear to have mislead the American people regarding the number of people in attendance at Barack Obama's Inauguration. Before the election, liberal outlets like The Huffington Post suggested there would be as many as 5 million people in attendance. Then the AP, having successfully made the transition from credible news source to liberal propaganda machine during the 2008 election, hyped a Mayor's unscientific estimate in their headline: D.C. Mayor Expects 3M For Inauguration. Baltimore Sun: "Inaugural crowd is estimated at close to 2 million"
Boston Globe: " The National Park Service says it will rely on a media report that says 1.8 million people attended President Obama's inauguration." LA Times: "Crowds surged in previously unseen numbers today for the presidential inauguration of Barack Obama, making it seem increasingly likely that the gathering would reach the record-setting mark of 2 million." Washington Post: "the official estimate released by the District yesterday is 1.8 million, a figure that would make the gathering the largest ever on the Mall." Backstory on that "official estimate released by the District" that the Washington Post is writing about. AP: "Park service spokesman David Barna said the agency did not conduct its own count. Instead, it will use a Washington Post account that said 1.8 million people gathered on the U.S. Capitol grounds, National Mall and parade route, he said." And that is especially interesting because if you follow the jump on the Washington Post story you'll find this nugget of info: "The Washington Post's analysis of the image concluded that about 1 million people were on the Mall." And the first page of the article mentions the parade route "was supposed to accommodate 300,000 people at its height". Fuzzy math, a journalist staple. Well, for those interested in some sort of actual journalism, ASU journalism professor, Stephen Doig, used satellite imaging to get an accurate (or at least a more accurate) count of the Obama inauguration crowd. His count, even after accounting for those still in route 40 minutes prior to the event, was around 800,000; which falls short of the 1.2 million record set in 1965 at Lyndon B. Johnson's inauguration. 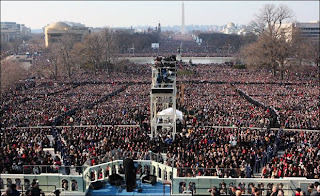 An ASU journalism professor using satellite images calculated that 800,000 people attended President Barack Obama’s inauguration ceremony. 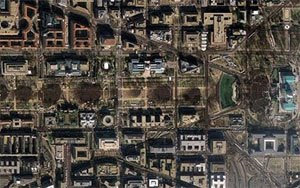 Walter Cronkite School of Journalism and Mass Communication professor Stephen Doig calculated the official inauguration crowd estimate after analyzing a GeoEye-1 satellite image shot at 11:19 a.m. from a height of 423 miles. GeoEye-1 is a military-controlled satellite. Doig said the image was taken 40 minutes before Obama’s swearing-in, but adjusted his estimation to include people who were still coming in before the swearing-in. Doig originally tried to calculate the crowd size through a camera hanging from a balloon 700 feet off the ground. The balloon was operated from the ground by a company called Digital Design & Imaging Service. The Virginia-based company specializes in taking scenic pictures for planning projects of architects and developers. Company president Curt Westergard asked Doig to calculate the amount of people at the inauguration from an image the camera took. The camera initially went up at 4:50 a.m. and took its last photo at 7:30 a.m. MST. Westergard said the camera was intended to take a picture two hours before the inauguration began, but because of George Bush’s early arrival and temporary flight restrictions, officials had the balloon come down earlier than expected. Doig said one of the issues with the camera was the clarity of the vantage point. He said that is the reason why he was unable to calculate the crowd size. “It was a beautiful photo but useless for crowd counting because it was not a clear photo,” Doig said. Jody Brannon, national director of the Carnegie-Knight News21 Journalism Initiative, said technology has become a tool to help journalists report fairly and responsibly. Dan Gillmor, director of the Knight Center for Digital Media Entrepreneurship, said Doig’s involvement in measuring the crowd size is significant. Gillmor said aerial imagery has become a useful tool when making crowd estimates. Reach the reporter at griselda.nevarez@asu.edu. You're making a number of logical fallacies here. First, you're comparing predictions to estimates. Second, your assertion that the predictions were "false" and were intended to "mislead" is based on a false dichotomy and is furthermore supported by absolutely no evidence. You arrive at that conclusion by fallaciously comparing pre-inauguration predictions to observation-based estimates. Yet, even if the figures could rationally be compard, you offer no evidence whatsoever for your accusation that the authors of the predictions were biased. Third, while I've spoken with Mr. Doig before and have the utmost respect for him as a journalist, I question his method of estimating crowd size by the single data point of an aerial photograph. The multi-source methods used by the Washington Post (which included aerial photographs, D.C. metro tallies, and other data points). But hey, kudos to you for "blogging" about what "real journalists" look like. Thank you for the comment, and thanks for reading. I've not conflated the terms "predictions" and "estimates" here. I provided links to both pre-inauguration predictions and post-inauguration estimates. What I've done is show that both the predictions and estimates of many news sources were wildly over-estimated in an attempt to hype the attendance of Obama's inauguration, and consequently the perception of his support. As for offering support regarding media bias, I must respectfully disagree with your opinion. 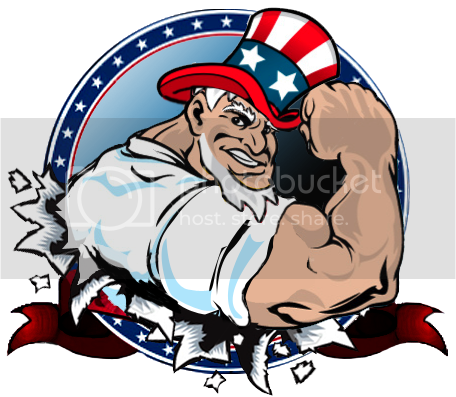 I regularly write about left-leaning media bias, particularly as it pertains to Barack Obama. In case you missed the more in-depth research pieces, you can find them here and here. Therefore, I didn't see the need to backtrack and recite every source and bit of evidence I've ever cited to mark the left-lean of the main stream media within this post. Moreover, I think the post speaks for itself. Journalists were so eager to be a part of a historic inauguration they were willing to hyperbolize the facts - such has been the case with Barack Obama throughout the entire election process. A recent article I relayed on this blog from Mr. Juan Williams summed up my sentiments nicely on this matter. As to your third point, I must honestly say that I've not had the pleasure of personally speaking with Mr. Doig, but I did find his mathematical process (explained more thoroughly in the CNET article cited at the end of my blog post) to be quite logical. Moreover, he used more than one aerial photograph (also explained in the CNET article) and left "wiggle room" on top of his estimate for those possible in transit to the event. He used several angles from several heights, to my understanding. But hey, that's the beauty of blogs, I'm allowed to look at the evidence myself, reach an educated conclusion, and then present my thoughts on a public forum rather than having a talking head - like the Washington Post - tell me what to think. After all, let's not forget that the internet was originally conceived as an open market place of ideas. It's a pity you don't like my product, but I stand by my statements.